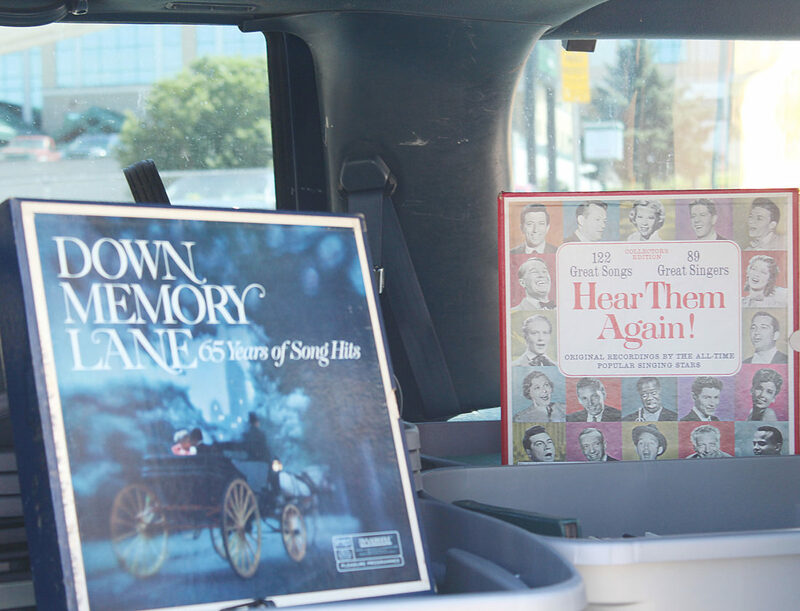 Mike Lucareli travels around the state to purchase unwanted record collections. On his trips, he will often fill the entire back of his vehicle with his hauls. The Bearscat Bakehouse sign is seen on Broadway, highlighting that they specialize in donuts. After their grand opening tomorrow, Bearscat will be open Monday through Friday from 6 a.m. to 3 p.m. The Minot Bearscat Bakehouse is located at 920 North Broadway across from Minot State University in the old North Hill Taco John’s. The bakehouse will celebrate its grand opening Tuesday. Pictured are Don and Connie Longmuir from Mountrail County Abstract Co. and Paula Bachmeier, Minda Stockdill and Nick Hacker from North Dakota Guaranty & Title Co. These heart-shaped donuts were offered at Bearscat Bakehouse locations earlier this year for Valentine’s Day. The Bearscat crew is constantly looking for ways to spice up their selection. This sign helps tell the story of four chaplains, each of a different denomination, who helped save others before their ship slipped beneath the icy water of the North Atlantic. o you or someone you know have an unwanted record collection? Do you or someone you know like to purchase and collect records? If the answer is yes to either of these, look toward Mike Lucareli. Lucareli was given a record collection that held 500 items from his parents. He decided to sell a few and he realized there was a demand for a record store that sold old records. He made the decision to devote his time and resources to his new hobby and job. He now travels the state of North Dakota purchasing record collections from those who no longer want or have a use of. He will travel to wherever a seller is to purchase the collections they have. He says he goes in, moves everything himself to his vehicle and gets out. “I like to make it quick and easy for the customer,” he said. He will buy as many old records as possible and after going through his purchase, he will clean those he thinks can be sold or that he can add to his own personal collection, takes photos of them, and posts them on his site for sale. “Most individual records sell for $3, but some very rare ones sell for higher,” he said. One such record he found was of The Trenchmen, a Minot band. It sold for around $1,000. Rarer records can sell for even more. In the months since setting off on his new endeavor, he has found success as he collects and sells. His collection has grown from a simple 500 records to an astounding 40,000 and is always growing. On his site, he works to list around 5,000 or more options for buyers. He sells around a couple hundred a month, making enough to pay for the fees he has for his business, but not much more. His knowledge of records and the history of them is expansive as well. He knows all the different varieties of records from antique Thomas Edison diamond discs to colored records to which pressing is the best sounding. He also has an interest in 7-inch reel to reel tapes, which were once used for audio for old movies. Lucareli is picky about his collection and what he sells. While he will buy entire collections, he looks them over carefully to ensure the ones kept or sold are only good or better quality. Anyone who is interested in selling their record collections can contact Lucareli via his email: classicautoman@hotmail.com. Possible buyers or sellers are also encouraged to visit his site at vintagerecordsautocollectables.com.